The players’ collective reaction said it all. After the final seconds had ticked away from the Catholic League AAA championship on Nov. 15 at Plymouth-Whitemarsh High School, Archbishop Wood (10-1) had the countenance of a team that had just won a regular-season game. Maybe that is the inevitable reality of a program that continues to dominate its prey with relative ease. The last time Archbishop Wood lost a division game was in the 2007 final against West Catholic. Since then, the Vikes have captured seven straight AAA titles, 39 consecutive division wins and 14 straight playoff victories. Their latest occurred in methodical fashion. Wood scored on each of its first four possessions to forge a 27-0 lead by halftime. On their first touch of the second half, star senior Jarrett McClenton returned a punt for another score. His ability to weave through would-be tacklers from left to right was breathtaking, and the subsequent, perfectly orchestrated two-point conversion toss from junior quarterback Anthony Russo to Christian Lohin was backbreaking because it increased the margin to 35-0 and thus, by rule, necessitated a running clock for the remainder of the contest. While playing against multiple substitutes, Ryan (5-6 overall) scored two touchdowns early in the fourth quarter to make the score more respectable. Wood two-way lineman and first-team All Catholic Ryan Bates wasn’t particularly bothered that the Raiders were able to break Wood’s shutout. Bates was asked about Wood’s tepid reaction to winning the Catholic League championship. “We definitely appreciate how important it is and how special it is to win this,” he said. “The Catholic League championship still means a lot to us. Some people think we take it for granted, but that is definitely not the case. The playmaker that Bates referenced was senior Samir Bullock, the AAA Most Valuable Player. Stymied by a Wood defense that allowed only four touchdowns against AAA teams during the regular season, Bullock finished with 85 yards on 16 carries. Now with 1,890 rushing yards and 21 touchdowns, Bullock needs 110 more against George Washington’s staunch defense on Thanksgiving Day to reach the 2,000-yard plateau for the second straight season. Wood also has a tremendous playmaker in McClenton. The senior tailback was given the championship game ball by an elated and appreciative Devlin, and for good reason. McClenton, who rarely discusses his burgeoning athletic resume, gained 125 yards on only 12 carries and he scored four touchdowns, three of them via the run. His performance elevated him to become Wood’s all-time leading rusher. Bullock said that he, his teammates and coaches accepted responsibility for the defeat. 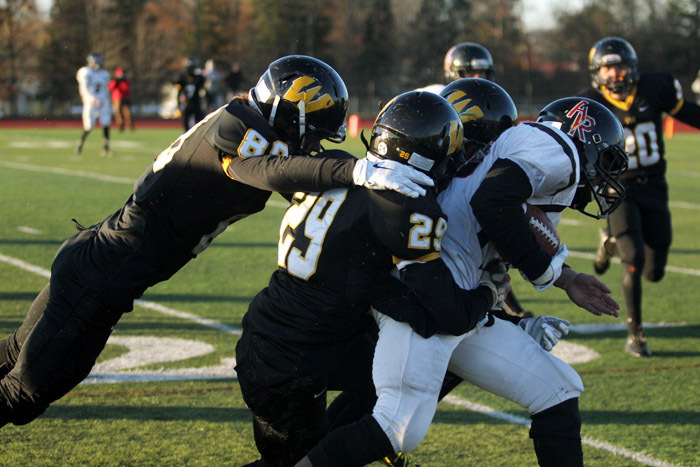 Against the likes of Archbishop Wood, few teams are.